There's a lot of information on our blog... please select the subject you're interested in! ...or search our two dollhouse sites only. Any of you who can actually paint will look at these pictures and know that I cannot :) But there's something unstressful about painting patterns... if any of you have a habit of doodling while you're on the phone or waiting on hold, you can definitely paint on doll house furniture! 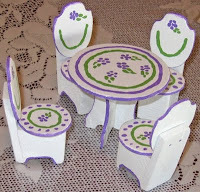 Here are pictures of some of my doll house table and chair doodlings... maybe it will inspire you to try too! One thing nice about paint, if you don't like it, just wait until it's dry, paint over it, and try again! Use a tiny brush. looks great. trying my hand at painting doll house furniture. what is thebest type of paint to use ?? I use craft paint - it dries quickly and covers well. You can get gloss or flat craft paint. For the base coat I do at least 2 coats of paint, sometimes 3. Questions or Comments? We'd love to hear from you! While we allow anyone to comment, we moderate the comments first, so may or may not post them. Thank you!